Financial institutions have long struggled to better meet the life insurance needs of their clients. The life insurance opportunity attained new urgency with the expected tightening of commissions under the DoL Fiduciary Standard and the fee compression driven by low cost ETFs and digital advice platforms. According to Kehrer Bielan research, the disappointment continues, however. Among 128 banks and credit unions that partner with 3rd party broker dealers, last year the typical firm produced only 2.7% of its investment services revenue from life insurance. Indeed, the median is significantly less than the average at 1.3%, reflecting the outsized success of a very few firms. Advisors in the median firm produced $3,881 in life insurance sales revenue last year, but the top quartile was twice that. Advisors in one firm averaged $104,090 in life insurance revenue. What can we learn from the top performers? Impact of Financial Planning. Only 20 of the 128 institutions track how many financial plans their advisors produce. But even with that thin sample, the role of financial planning as a driver of life insurance sales stands out. Advisors in firms whose advisors produce at least 1 plan per month had $12,664 in average life insurance production, 54% more than firms that did fewer plans per advisor. Note that the average for the firms with less than 1 plan per month per advisor is higher than the top quartile for all 128 institutions. That is because almost all of the 20 firms that reported financial planning data had life insurance sales above the average. 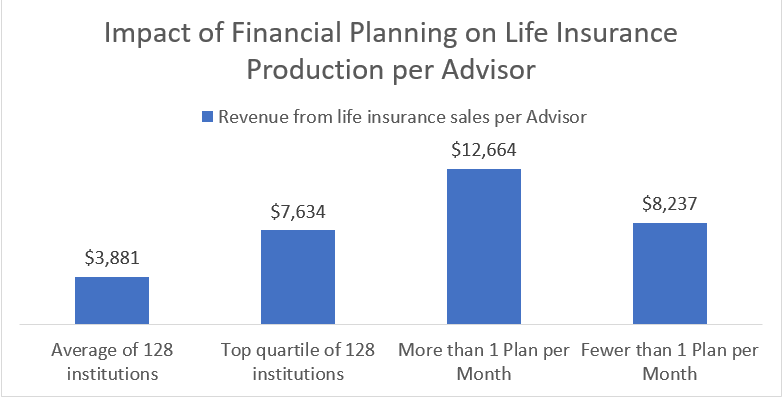 Our previous study of the impact of financial planning found that advisors in institutions that averaged at least 1 plan per month had life insurance sales revenue that was 19% higher than their peers in other institutions who did fewer plans. Financial planning appears to be the one lever financial institutions can use to kick start their life insurance business. Kehrer Bielan Research & Consulting provides original, award-winning research, actionable consulting, and continuing study of the financial advice industry through its peer groups. Complimentary copies of the firm’s research on financial planning can be accessed at this link: http://kehrerbielan.com/index.php/consumer-research.